In keeping with the refreshing sense of flexibility which infuses so much of what happens at CLC Duchally Country Estate, those wishing to dine here have a variety of options available to them. You can read our hotel review for CLC Duchally Country Estate here. 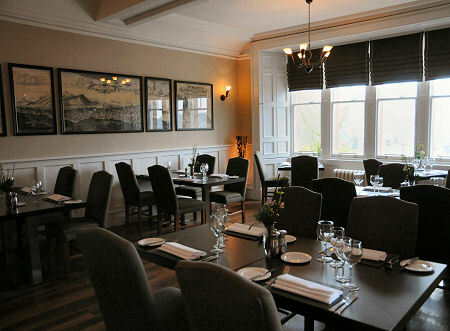 At the heart of the dining experience is Duchally's 40 seat Monteith Restaurant. This attractive L-shaped room occupies the rear of the ground floor of the main hotel and has a style very much in keeping with a swish but comfortable bistro. It is also possible to eat in the comfortable wood-panelled bar which comes complete, on cold days, with a real fire at one end. Luncheon is served from a three-course menu which features a selection of dishes that would be at home in a good bistro. Local sourcing is important, and - apart from the seafood for obvious reasons - a large part of what is prepared by the kitchen is sourced in Perthshire. Wherever possible, ingredients are certified as being organic and of traceable origin. Meanwhile, the Leisure Centre at Duchally serves a range of snacks throughout the day, including everything from soup and sandwiches to baked potatoes and pizzas. As dinner approaches, the hotel offers an Early Bird evening menu aimed specifically at families: and kids eat free from the children's menu when accompanied by two adults. 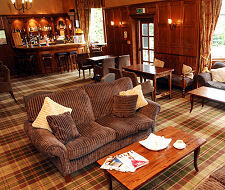 Duchally also offers those staying on the estate a take-away menu, which you will find in your lodge. Your order is phoned into the hotel, and you are phoned back when it is ready for collection. Dinner at Duchally is the highlight of the dining experience and is served from an a la carte menu. It should be booked in advance. The menu changes on a seasonal basis, and offers a wide enough choice to ensure that if you are staying for a week you can still try something different every day. When we visited there were eight starters, ten mains plus side orders, and eight sweets including the selection of Scottish cheeses: a nice touch was the menu stating which cheeses were on offer. Combine the wide choice with high standards of ingredients, preparation and presentation, plus outstanding service from friendly and helpful waiting staff, and the end result is a dinner it is well worth walking from your lodge - or travelling from further afield - to enjoy, whatever the weather. An account of a particular meal can only give a snapshot that is likely to be overtaken by the changing menu, but does give a flavour of the attractive and enjoyable dining style. We had starters of "baked filo parcel of goats cheese and red onion marmalade" and the "Scottish platter". Both were lovely, and the platter was especially interesting, combining hot smoked salmon, quail scotch egg, haggis fritter, smoked venison and king prawn. Mains comprised a "panfried breaded loin of pork" and a "roast loin of venison". Again, we'd heartily recommend both, and the venison was quite possibly the best we've ever eaten. For dessert we enjoyed a "warmed Ecclefechan tart served with Drambuie ice cream" and the selection of Scottish cheeses. The experience concludes with tea or coffee served with petit fours. Breakfast at Duchally is served in the restaurant, and you will be asked on arrival or the evening before when you wish to take it. It comprises a first course from a well stocked and attractive cold buffet followed, if you choose to go beyond the Continental option, by a hot buffet second course. Hot buffets at breakfast can be hard to get right. At Duchally the combination of fine local ingredients (at the time of our visit they were looking at the option of introducing a "Perthshire Breakfast" entirely sourced from within the traditional county), good preparation and care in maintaining the buffets led to a truly excellent breakfast and a superb and memorable start to the day. You can read our hotel review for CLC Duchally Country Estate here.